Review: Adam Neustadter's "Julien & Claire" starring Olivier Bernard and Matilda Kime. - Films de Lover, films d'amour et comédies romantiques. There are treasure everywhere. In so many words, Calvin & Hobbes described the best thing about alternative distribution platforms available on the Internet. Treasure that is for us to discover, outside the regular patterns of films distribution. "Julien & Claire" is one treasure, a flawed one but enjoyable nonetheless. "Julien & Claire" is one hell of a magician. We know it has got a shoestring budget but it hardly shows that, thanks to the beautiful images it provides during eighty minutes (upon purchase, you might want to download the 5 Gb HD version that's well worth the download time) and the amazing quality of the songs sang by Olivier Bernard, the leading actor/singer. They are beautiful, expressive and delicate pieces of songwriting that clearly defines that man, lost between his love for singing and the comfort of an employee life that lays ahead of him. When he meets Claire, an American dancer just as lost, they help each other correct the course of their life. 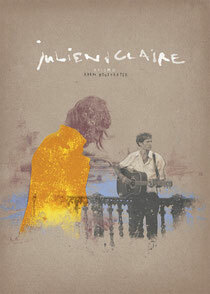 As a boy-meets-girl story, "Julien & Claire" is quite classic and never tries to be something different than a well-filmed love story (although it does use an awful lot of lens flares and Instagram-like filters for its own good), a musical discovery of an attraction between two people. It might sometimes look like an 80-minutes long music video but when the music is that good, it clearly is not a problem. Between the two lead actors, there's a bit of on-screen chemistry even if it probably lacks a little passion. Acting is probably the main flaw of the film, among the supporting cast especially but also with the two lead actors in some part. Julien's moody face for example does not a good job during scenes where he should have shown more feelings. His parents are also not so well portrayed but then again, they are not professional actors so why would they? That's when the tiny budget takes its toll but that is a small flaw compared to the overall production quality. The main problem as far as I am concerned is a common one when it comes to indie romantic film and it always is a truncated ending that clearly does not satisfy its audience. In romantic films, more than in any other film genres, you need to have a clearcut ending and that seems to be something that this new generation of filmmakers have a problem with. It probably represents the uncertainty of life but it really ruins films for me. This is just a personal concern and if that's ok for you, then you should give "Julien & Claire" your whole undivided attention. In the meantime, I will be here, listening again and again the beautiful soundtrack. Synopsis : Shot over ten days in France, Julien & Claire is a music-driven mood piece about a romance between an American dancer and French musician. Available for 4,99$ on Chill (and 10$ if you buy it with the soundtrack, which is highly recommended).